Midsummer in Sweden is a time to be merry, sing, dance, drink and feast. The festivities always fall on a Friday, around the summer solstice, the longest day of the year. Traditionally, sill, or pickled fish, is always served, along with numerous shots of schnapps, while singing old folk songs at a large table, out in the garden or summer house, with friends or family. Though it can be flavored with most anything, the fake sill I've tried, made by the husband, is slathered with whole grain mustard and vinegar and offers a delicious tang with the other accompaniments. By fake, I mean that we make it with eggplant instead of fish, and the fish eaters have said our veggie version is surprisingly similar to the real thing! The protein varies from sausages to some slab of meat or fish, but we of course opted for a vegetarian alternative, in this case, mushroom marinated tofu. 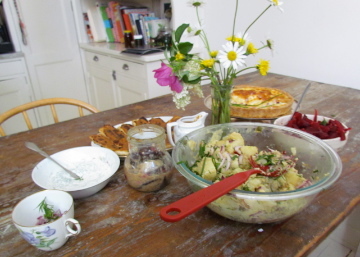 There is always a potato salad perfumed with dill, red onion and sour cream. And beets, either roasted or in salad form. But our favorite dish is a cheese pie with Västerbotten cheese, which is produced in northern Sweden and tastes like an excellent sharp cheddar -- a good substitute. It's creamy, nutty, sharp and melty, so I highly suggest you try to acquire it. While we've broken from tradition in all other ways, we made Västerbottenpaj -- it's much like a quiche, but loaded with cheese, so you can't go wrong! Another tradition during midsummer is for a single gal to pick 7 wild flowers and place it on her pillow during the night. This will grant her her dream man! Well, it worked for me -- 3 years ago, I picked wild flowers, with the help of my dream man, and he did become my dream husband. This time of year boasts the loveliest wildflowers in Stockholm, like the gentle daisy and the most fragrant roses. So even if you're not in Sweden, I hope this array of dishes will guide you into your own midsummer feast! Sautee the eggplant until tender. In a glass jar, add all the ingredients. Check for seasoning. Refrigerate overnight, or for at least 3 hours prior to eating at room temperature. Boil the potatoes until tender. Chop them to your liking. In a large bowl, mix mustard, oil, salt, pepper, lemon, capers, onions, and the warm potatoes. Check for seasoning. Lastly, add the fresh dill. 1. Blind bake your pie crust in a 9-inch tart pan for 15 minutes at 350F or 180C, then take off the pie weights/beans and bake for another 10 - 15 minutes, until lightly golden and cooked. 2. Sauté onion in 1 tbs olive oil until golden. Season with salt and pepper. 3. Layer the onion in the cooked tart shell, then layer the grated cheese. In a separate bowl, beat the egg, milk, salt and pepper. Place the tart on a sheet pan. Carefully and evenly pour the liquid onto the cheese mixture. Bake in a preheated 200C or 400F oven for 20 - 30 minutes, until puffed around the sides and set. Allow it to rest for 15 minutes before unmolding. 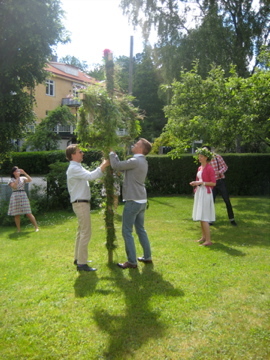 Jag vill göra veggisillen till midsommar men undrar hur många personer receptet du lagt upp här räcker till? Nice to hear from you. So happy you'll be making the eggplant sill, it's delicious and everyone is always impressed! This recipe makes enough for around 4 people (about 1/2dl each)! Hope that helps! Let me know how it turns out or if you have any other questions! Hoppas du har en trevlig sommar och midsommar!